A healthy twist on a classic dish. P28 High Protein Pancakes are the perfect option for those leading a healthy lifestyle who don’t want to give up their favorite dishes. A hearty breakfast staple that is perfect for both adults and children, these pancakes are a healthy twist on a classic dish. 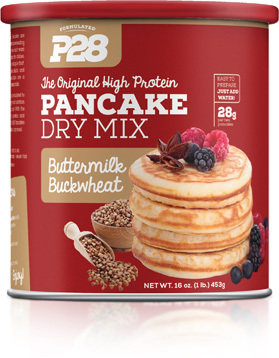 Our P28 Pancake mix is formulated to provide you energy and nutrition when you need it most. With a great balance of protein and carbohydrates, our pancakes are an excellent addition to any meal. If you are a fan of our White Chocolate Spread, you are going to fall in love with our all-new White Chocolate Pancake mix. It’s made with the highest quality source of protein - whey isolate, and white chocolate. Make your morning breakfast extremely delicious, nutritious, and full of protein power! Our Buttermilk Buckwheat Pancake mix is a true healthy twist on a classic dish. It’s made with the highest quality source of protein - whey isolate, sweet buttermilk, and buckwheat. Start your day off right with an extremely delicious and protein powered stack of P28 Buttermilk Buckwheat Pancakes! How do I properly store the P28 Pancakes mixes? We recommend that you store our pancake mixes at room temperature. We strongly request you do NOT refrigerate or freeze them. What is the shelf life of the P28 Pancake mixes? Our pancake mixes last up to 1 year. 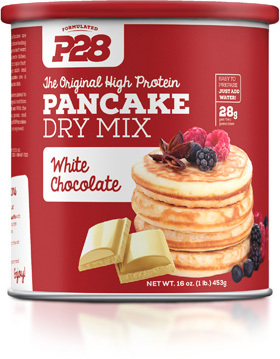 Are your P28 Pancake mixes Gluten Free? No, our pancake mixes are NOT gluten free.